Last week on The 40 Year Old Boy, “Let Me Get on Up,” the titular boy, Mike, had an epiphany of sorts. He’s been podcasting for eight years now, delivering a weekly monologue of absurdity with commendable regularity. This week, though, might be the first time he produced it himself. If it was a joke, it’s embedded throughout the episode, as Mike bemoans having to learn Audacity after putting it off for eight years, and Lili the producer laughs gleefully throughout as he comes to grips with having to figure it all out after leaving the work on her for so long. The validity of Mike’s gripes aside, the chord he struck with me this week was figuring stuff out. When you’re on your own and you don’t have knowledgeable primary sources in your circle of friends, if you want to get anything done, you have to figure stuff out, whether it’s how to play a new board game or how to produce and publish a podcast. Problem-solving is a muscle to develop. Experience breeds eventual success, and success breeds confidence. Happily, we live in the era of the internet, where there are innumerable how to guides and tutorials on any subject imaginable. The knowledge is available. You have to be willing to start somewhere, though, and you have to be willing to try and see what happens. I taught myself to play Arkham Horror thanks to the rules reference created by Universal Head — now the Esoteric Order of Gamers — and my disinterested yet patient cousin Margot. When I wanted to make a podcast, I figured it out twice. 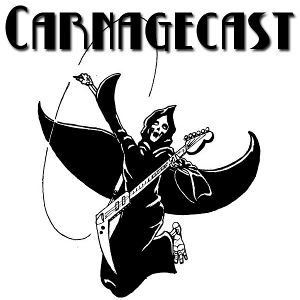 Once in the typical manner, with the PowerPress plugin to publish Carnagecast, and then a no-money route for Held Action Theatre, both times creating a podcast that, from the outside, looked and sounded like any other you would find in the iTunes store. That second time it was entirely about experimenting and testing the workflow. I’m still pretty proud of pulling together so many disparate parts to make a well-produced, syndicated podcast. The same attitude went into creating Decked! I wanted to learn about publishing video on the web and building a YouTube channel in addition to putting out content for Call of Cthulhu: The Card Game. It also gave me the opportunity to experiment with live streaming a game of Sentinels of the Multiverse, and learn about the software and hardware needs for that style of show. To circle back to what first got me thinking about building the problem-solving muscle, it’s easy to put up barriers for ourselves. Mike puts up barriers of “I don’t know how to do that,” when he has access to resources to figure it out. I put up barriers of “I don’t have anything worthy to say.” While I enjoy overcoming technological and process-related problems, thinking I don’t have anything worth saying is a barrier with which I still struggle. So I give myself defined spaces in which to work on that, like starting up a blog about tabletop games, for instance. Most recently, it’s becoming fluent in Call of Cthulhu and better able to riff and ride a conversation to make commentary meaningful and entertaining. A new board game podcast premiered recently, called Cardboard! with Rich Sommer. Probably best known for playing Harry Crane on Mad Men, Rich is also a huge board game nerd. I’d heard this fact mentioned on various podcasts over the last couple years, but there wasn’t anything to follow up on. Now with Mad Men concluding, Rich has launched a podcast of his own, just to talk about board games. The tone of Cardboard! is generally about introducing board games to newcomers. The show’s guests seem to be mostly friends who have played a game or two, or casual players, usually with a hint of celebrity around them. Rich usually tries to frame the discussion in terms of what newcomers to the hobby might want to try, and how to go about doing so. Given Cardboard!‘s position in the podosphere as a show on the pop culture-centric WolfPop network, that’s a sensible position. Episode five, “Getting Our Hands Dirty,” bucks that trend with a full-on game nerd, Kevin Sussman, and game designer Mike Selinker. I especially dug this episode because Rich and Mike talk about the genesis of Betrayal at House on the Hill, a personal favorite of mine — and Rich’s, it turns out. During that episode, the interesting point comes up a game that tries to inject theme purely through flavor text on cards and rule books fails. The mechanics of the game have to be part of creating the theme. The example comes up of Martin Wallace games: the rules of a rail tycoon game encourage ruthless exploitation, and so the players find themselves feeling like exploitative rail tycoons. I was happy to see that All Games Considered returned from hiatus this week. Mark and Carol checked in, discussed the Gen Con hotel fiasco and reaffirmed their commitment to the show, in spite of the many demands of real life. They also brought up that the show’s ten year anniversary is coming up, which blows my mind. All Games Considered is one of the very first podcasts I listened to, back when I complained about not having enough new stuff to listen to while driving and a coworker said, “Have you looked at podcasts?” In all its incarnations, All Games Considered has been in my podcatcher of the moment since then. Here’s to ten years! Last week on The Dork Forest, Jackie Kashian learned about LARPing from Christian Brown and Roselle Hurley, with Jackie’s husband Andy sitting in and offering his own thoughts as a game designer and general GM-type person. Christian and Roselle run an ongoing LARP called Starship Valkyrie. As my mental conception of LARPing is jammed somewhere between that one truncated Vampire session I played in high school and what I’ve picked up about combatty LARPs in the woods with foam weapons and beanbags as magic missiles, I appreciated Christian and Roselle providing a great example how a LARP doesn’t necessarily have to be high drama scheming or swinging foam or rattan swords. And I still very much wish Jackie would record a session or two of her group’s role-playing campaign, just to hear how she plays a character. Tactical? High character? Munchkinly? I want to know! I feel like I missed a beat somewhere. Never Not Funny‘s Pardcastathon charity auctions include playing a game of FATE with Jimmy Pardo — comedian, podcaster and “America’s Hair Dad” — and Eliot Hochberg, with Mike Olson, designer of Atomic Robo, running the game. This must be Eliot’s doing, as I can’t picture Jimmy having any idea of what a role-playing game is, beyond what he’s been told by Eliot and Garon. As of this writing, there are six hours left on this auction, which benefits the charity Smile Train, which provides corrective surgery for cleft lips and palates. Bid on an auction, or go to Pardcast.com to donate! And please, oh please, let them record the game as a bonus episode of Never Not Funny.